﻿ Boat and caravan cushions. 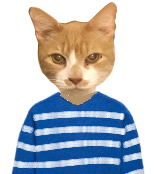 I’m doing this one - Horace is petrified anywhere near water. He’s not too good with confined spaces either. Cushionzone can get you any shape of boat or caravan cushion, for indoor or outdoor use. Complicated or irregular shapes may need a paper or card template. Photos of our work, below, sent in by customers. Cushionzone can get you cushions and mattresses for most kinds of seating and sleeping areas inside boats and caravans. Any of our indoor fabrics can be used for boat and caravan interiors. You can see our recommendations for the best fillings of boat and caravan seating and sleeping cushions or mattresses by tapping the orange “ cushion fillings” square towards the bottom of this page. We also have a wide range of weather proof fabrics suitable for deck and cockpit cushions. Simple “bench” foam is usually best for these, a nylon liner is a worthwhile addition if they are likely to be out in the open, in wet weather. Liners plus mesh undersides to the cushion covers if they’re really going to get a regular drenching! 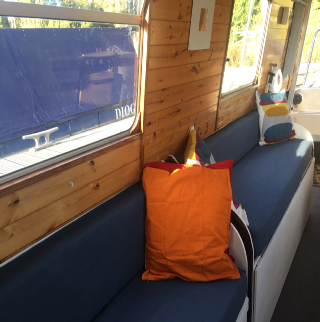 We’re happy to copy your original boat or van cushions to make replacements for worn upholstery,or help you to realise completely new designs and configurations. 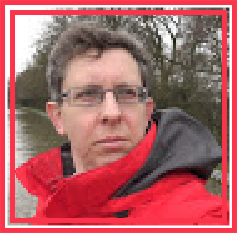 The gentleman, pictured above, films a very entertaining and informative narrow boating vlog which everyone should subscribe to ! Just click on his portrait to watch a very entertaining short video featuring our boat dinette cushions!